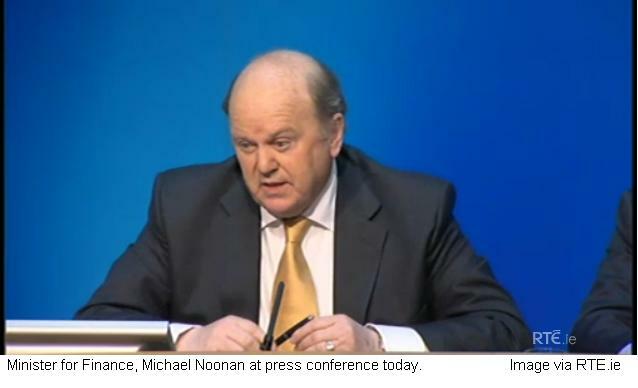 It’s not often that NAMA gets a pat on the back, but during the end-of-review Troika press conference this morning, Minister for Finance, Michael Noonan was asked about NAMA and the recent Comptroller and Auditor General report. Surprisingly, Minister Noonan said that on the two occasions on which he met with the Troika on this visit, NAMA wasn’t mentioned at all. Although this wasn’t stated, the fact that NAMA wasn’t mentioned with the minister nominally responsible for the Agency, probably indicates the Troika doesn’t have concerns for the Agency. Which would be in itself, a pat on NAMA’s back. You might recall that there was a review of NAMA by career banker Michael Geoghegan at the end of 2011, in which he called for a more business focussed approach by NAMA as it got stuck into its asset management phase. Following the review, Minister Noonan created a NAMA advisory board which comprises Michael Geoghegan, Denis Rooney and NAMA’s own chairman Frank Daly. Yes it’s a bit laughable when you imagine Frank Daly meekly asking if Minister Noonan still wanted an advisory board! But presumably the other two, Michael Geoghegan and Denis Rooney would have a more independent opinion on NAMA’s progress. So a (rare) pat on NAMA’s back. I think Michael is taking the p*ss. The reasons why have all been detailed here many times – but read the Agency’s objectives in the NAMA Act. and think of the fact that NAMA that was projecting a billion euro profit off a discounted base a year ago and is now heading for a €10 billion loss (that’s just for a start). Nah, Michael was definitely on the stronger tablets or had a liquid lunch when he made that announcement. Whoops, I see that it wasn’t Michael that said that at all – but Frank Daly in his double-jobbing role. Shades of Mandy Rice-Davies then. Appears to be quite a bit of interest in the senate hearings on HSBC and Mike Geoghean,he was not listed as a witness. Here is the link to the hearings,the investigation was well know and was mentioned on here before. Linked the witness statements and video of the hearings.